Read by David Mitchell and Robert Webb the comedy duo tackle various subject matters in a 'How to Cope with...' guide addressing various scenarios, and everyday situations. 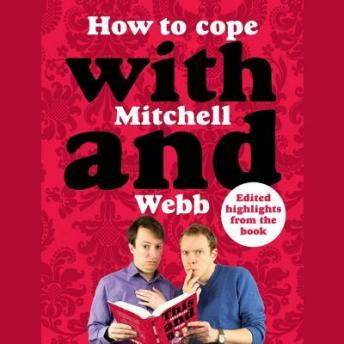 David Mitchell and Robert Webb tackle various subject matters in a 'How to Cope with...' guide talking you through every day scenarios and situations. The subject matters talked about are 'How to Cope with... Being Normal, Pubs, Being dumped Parts 1 and 2, Coffee, Malmaison Hotels, Nudists, The Smoking Ban, Actors, Servants and Getting Older'. This recording doesn't need to remind us just how great Mitchell and Webb are as a comedy duo and will by no means need to even attempt at getting the listeners attention once the play button is pressed but will simply show us once more everything we know and love about Mitchell and Webb and why their quirky hilarity and foibles work so well together. For example... How to cope with Actors...Try 'not be put off by their luvvie-ness' and 'do not assume that all actors are all thick...Stephen Fry is an actor and also a world class boffin. David Mitchell's GCSE results are very impressive'.